Ginger is all the rage! So many products have been developed that include this ancient root... and with good reason. Chop up a little fresh root and add it to a stir-fry, or grate some into your mint tea. Ginger is so versatile it can be added to both sweet and savoury foods. It doesn’t take much to add a bit of spice to your life. YES! Use ginger to improve your health! 1. Beat inflammation with ginger. Ginger has the ability to beat painful inflammation by inhibiting the effects of arachadonic acid. Arachadonic acid is a necessary fat that is responsible for triggering the inflammation involved in the immune response, and ultimately leads to pain at that site. Boosting your ginger intake can reduce the feelings of pain caused by inflammation. Choosing ginger as an alternative to over-the-counter anti-inflammatory drugs gives your liver a break from needing to work overtime and clear these drugs from your system. 2. Manage Osteoarthritis with a ginger compress. Ginger has been used for thousands of years in China to treat the pain associated with osteoarthritis. The ginger is boiled and grated into a compress, then applied to the affected site. 3. Inhibit the growth of cancer cells in your colon with ginger. Ginger contains a compound called gingerol, which has been shown to suppress tumour growth of already formed tumour cells. It has also been shown to inhibit the expression of proteins that trigger the initial development of cancer cells specifically in the colon. So, boost your fibre and your ginger for the ultimate intestinal cleanse! 4. 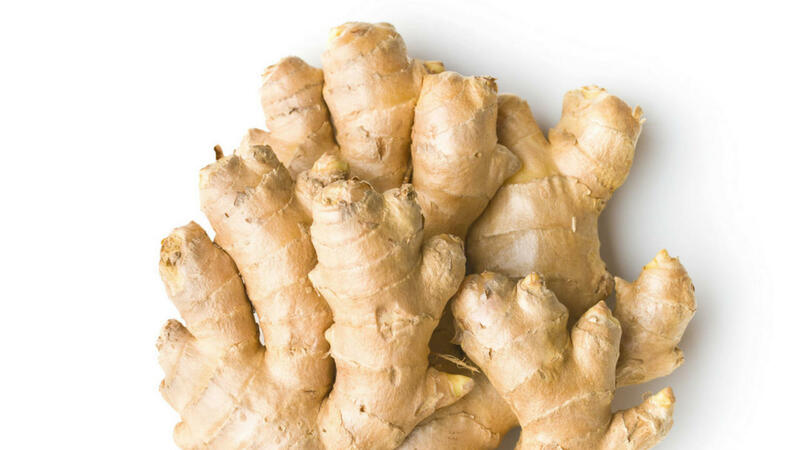 Stop nausea and vomiting during pregnancy with ginger. Studies have shown that ginger is just as effective at relieving nausea and vomiting in pregnancy as the many over-the-counter and pharmaceutical drugs. It can boost a mother’s immunity, as well as the baby’s immunity, in the process. It also has a cleansing effect on your digestive tract and puts much less stress on your liver during pregnancy. 5. Prevent ulcers and heartburn with ginger. As a very potent antioxidant and antibacterial agent, ginger can clear pathogens from your blood stream and digestive tract. It has been shown in studies to kill the H. Pylori bacteria that can cause heartburn and digestive upset. Ginger also allows the mucosal wall of the stomach to build up, thus protecting the stomach against ulcers and damaging pathogens. Please Note: Beware of ginger coated in sugar. Ginger has a sweet basenote, so if you would like to add to its natural flavour, try using honey. Brett White MD: “Ginger: An Overview.” Keck School of Medicine, University of Southern California, Los Angeles, California. 2007 American Academy of Family Physicians. Kristen Gaus, Yue Huang, Dawn A. Israel, Susan L. Pendland, Bolanle A. Adeniyi, and Gail B. Mahady: “Standardized ginger (Zingiber officinale) extract reduces bacterial load and suppresses acute and chronic inflammation in Mongolian gerbils infected with cagA+Helicobacter pylori.” Pharm Biol. 2009 ; 47(1): 92–98. doi:10.1080/13880200802448690.